The Risk Management Agency has released rates needed to calculate 2018 crop insurance premium. Revenue Protection (RP) rate changes suggest slightly higher corn premiums and lower soybean premiums. Given that 2018 projected prices and volatilities are lower than 2017 values, premiums in 2018 could be near or slightly lower than 2017 values. As a result, premium changes likely will not influence 2018 crop insurance decisions. Rates set by the Risk Management Agency (RMA). Each year, RMA adjusts the rates used to set premiums on crop insurance policies. These rates reflect past loss experience associated with crop insurance policies. For 2018 premiums, information for the 2016 cropping year is incorporated into rate setting. Information from 2017 is not incorporated as not all loss information has been compiled to set rates. In addition to loss experience, RMA periodically conducts studies that can changes various items within rates. RMA has released all rates for 2018. Projected prices and volatilities. Projected prices used to set crop insurance guarantees will influence premiums, with higher projected prices resulting in higher premiums. In addition, volatilities influence premiums, with higher volatilities resulting in higher premiums. For corn and soybeans insured in Midwest states, projected prices are averages of settlement prices during the month of February. Volatilities are based on options prices during the last five trading days in February. As a result, all information need to calculate 2018 premiums will not be known until the end of February. Corn: $3.91 per bushel projected price and .19 volatility. Soybeans: $10.19 per bushel projected price and .16 volatility. Calculating 2018 premium in this manner allows focus on the impacts of rate changes on 2018 premiums. 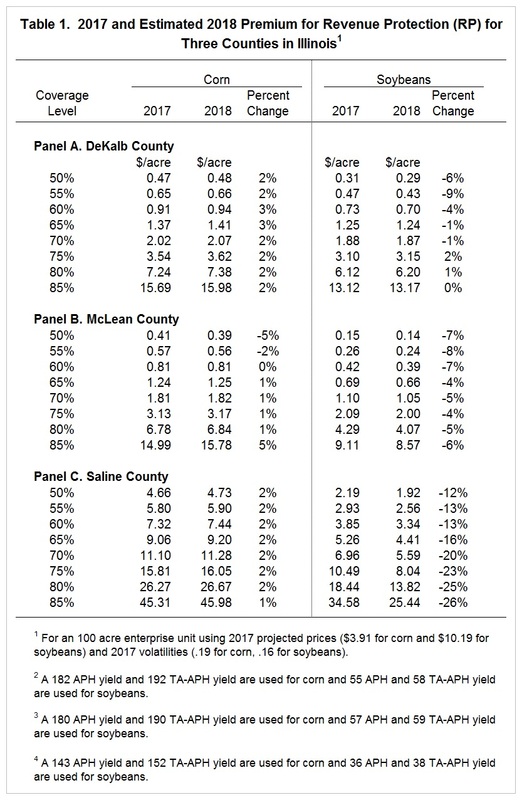 Table 1 shows premiums for Revenue Protection (RP) in three Illinois counties: DeKalb, McLean, and Saline Counties. DeKalb County is in northern Illinois, McLean County is in central Illinois, and Saline County is in southern Illinois. Actual and estimated premiums are shown for both corn and soybeans. Premiums are stated on a per acre basis using a 100-acre enterprise unit. Actual Production History (APH) and Trend adjusted APH (TA-APH) yields are near the previous ten-year averages. In addition to 2017 actual and 2018 estimated premiums, Table 1 also shows percent changes in premiums. Take the 85% RP premium in DeKalb County as an example. The 2017 premium is $15.69 per acre while the 2018 estimated premium is $15.98 per acre (see Table 1). The 2018 premium is 2% higher than the 2017 actual premium. For the three counties shown, corn premium changes tend to be 1% to 3% higher. The highest premium increase is 5% for an 85% coverage level in McLean County (see Table 1). Two corn premiums decreased: the 50% and 55% coverage levels in McLean County. For the three counties shown, most soybean premiums decreased. Exceptions were at the 75%, 80%, and 85% coverage levels in DeKalb County which respectively changed 2%, 1%, and 0% (see Table 1). Large premium decreases occurred for Saline County. For example, the 75% coverage level soybean policies decreased by 23% from $10.49 per acre down to $8.04 per acre. For corn, 2018 rate changes usually result in relatively small increases in 2018 premiums. These increases likely will not have much of an influence on crop insurance decisions. For soybeans, rate changes mostly decrease 2018 premiums. Lower premiums could encourage soybean insurance use. However, part of the reason for lower premiums is low loss experience in recent years. Estimated 2018 premiums will vary from that shown in Table 1 due to actual projected prices and volatilities varying from those used in Table 1 estimation. At this point, expectations are for lower projected prices and lower volatilities in 2018 as compared to 2017. Lower projected prices and volatilities would result in lower 2018 premiums than those shown in Table 1. For corn, 2018 premium could be lower than 2017 even given rate increases. More will be known at the end of February.